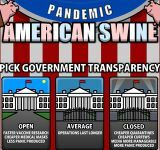 Unlike any of it's prequels, Pandemic: American Swine deals with the spread of a virulent virus: The Swine Flu. The game takes place over an extremely detailed map of the United States. You play as the government and your task is to save as much of the population as possible. You have complete control over airports, seaports, hospitals and more. Can you thwart the virus and prevent the impending doom?